The American Center for Mobility (ACM) recently built a U.S.-based connected and automated vehicle (CAV) research facility in Ypsilanti, Mich.—the heart of the automotive industry. The center is a proving ground for CAV product testing, development, validation and certification. The 500-acre site includes a driverless 2.5-mile highway loop, two double overpasses, a railroad crossing, intersections, roundabouts and a 704-ft-long curved tunnel. 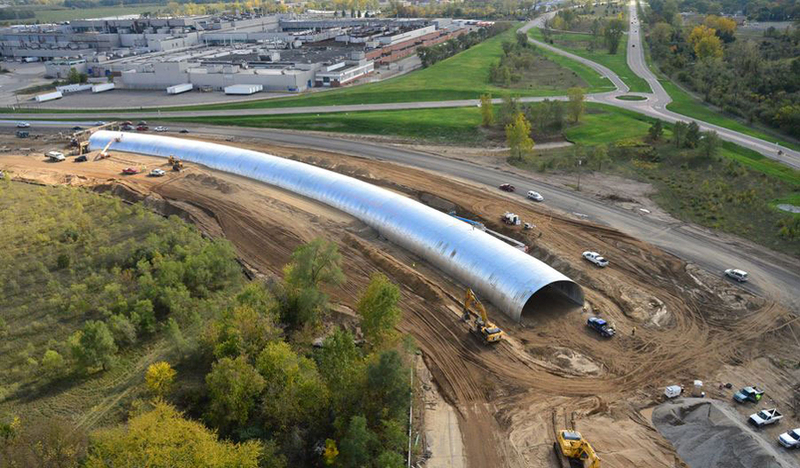 The curved tunnel—the largest of its kind, provided by Contech Engineered Solutions—is 704 ft long with a 49-ft-5-in. span by 24-ft rise Deep Corrugated Structural Plate tunnel with 9- to 4.6-degree elbows. In the preliminary design stages, the engineer coordinated with Contech’s team on different tunnel concepts. The ultimate goal was to create a tunnel where an automated vehicle enters the tunnel, but cannot identify the exit. Thus, the design of a lengthy, curved tunnel was paramount to the project. The Deep Corrugated Structural Plate solution was identified as the most cost-effective option available to the market. The custom-shaped design was able to meet the required clearance box, include elbows to transition the tunnel and create a lightweight design allowing for the use of a cast-in-place spread foundation. In addition, the contractors designed the entire structure for a Class II natural sand backfill—an economical, locally available material procured. The final design of the Deep Corrugated Structural Plate structure included cast-in-place headwalls, a lighting and mechanical system, and external waterproofing. By utilizing a 2-radius arch system, ACM was able to significantly reduce overall construction costs with material, foundation and installation savings.